In the last 100 years understanding of our planet and the animals with whom we share it has grown enormously. We have made great strides in technology, medicine and learning. However, many people question how we can consider ourselves civilized while allowing the suffering and abuse of animals for entertainment. How far do we still have to go? Animal Defenders International (ADI) Undercover Field Officers ~have witnessed, videotaped and photographed animal suffering in traveling circuses in the South America and around the world. The Officers worked alongside circus workers, recording the daily routines, animal care practices, and physical and psychological effects on the animals. The Field Officers gathered evidence on notes, videotape and photographs. This report details the results of our investigations and our recommendations for a humane solution to a widespread problem. Read it in conjunction with the DVD Stop Circus Suffering (2007), which includes much of the disturbing video footage collected during the course of the investigation. The video is available from the organizations listed on the back cover of this report or can be viewed online at http://www.youtube.com/adisudamerica. ADI’s Field Officers conducted surveillance or secured employment with South American circuses, providing an unprecedented, behind-the-scenes view of the way the animals were treated. The Officers had access to training sessions that would normally take place away from public view, when circus personnel did not know they were being watched. That is when the worst and most sustained abuse of animals took place. Not only does our evidence confirm that animal suffering is inherent in traveling circuses, it is not restricted to wild or exotic species. Despite popular misconceptions, domestic and farm animals suffer in circuses as well. Independently published scientific research on the effects of travel and prolonged confinement on animals also supports our evidence. However, other than ADI’s evidence, there has been little first-hand data on the treatment of animals and its effects on them specifically in traveling circuses. We therefore review the scientific studies of animals during transport, in confinement and in captivity for other industries, such as zoos and laboratories. These studies and others on the transport of horses show how the evidence can apply to traveling circuses as well. 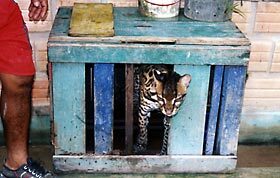 The South America investigation began on 2003 and it contains a thorough and detailed study, never conducted before, about the use and treatment of animals in travelling circuses in Bolivia, Chile, Colombia, Ecuador and Peru. Such study was based on detailed observation of circus animals randomly selected in each country - Bolivia (2 circuses), Colombia (4 circuses), Ecuador (5 circuses), Peru (7 circuses) and Chile (7 circuses). The results of our investigation reflect a systematic pattern of abuse, severe confinement and deprivation, which the animals are being subjected. The temporary nature of traveling animal circuses and the close proximity of dangerous animals to the public mean that these establishments can never be entirely safe. Around the world, circus workers and members of the public, including children, have been killed and maimed by animals in circuses. Lions, tigers and elephants have all escaped, and people have died as a result. On July 2004 in the Peruvian circus “Hermanos Caballón” was touring in Bolivia. At the end of the show, a lion escaped of its cage and attacked an 8-year-old child and his father, when he tried to defend the minor. As consequence of the attack, the child lost an eye and they both suffered from other wounds of gravity. In addition to the risks against people, it is important to note that this type of circuses are also a risk for the same animals. The circuses take along with them wild animals, many of which are mixed with other incompatible species, thus affecting their safety, natural way of life and threatening their survival capacities. The behavior of a domestic animal is still highly influenced by its wild ancestry, such as herding behavior in horses and predator responses in domestic and wild herbivores. Therefore, studies on domestic species give an indication to how related exotic species may respond to certain stimuli. According to Webster, “The welfare of an animal is determined by its capacity to avoid suffering and sustain fitness” (1994; 2005). Conversely, according to the Concise Oxford Dictionary (1981), suffering means “to undergo or experience pain or loss or damage or disablement” and includes mental as well as physical suffering. Fitness for an animal includes mental and physical fitness. So welfare is not just about ‘doing things’ to make animals feel better and keep fit, such as feeding them well and inoculating them against disease. It’s about giving animals some control over their environment (Broom, 1991; Webster, 1994; 2005). That control allows them to avoid pain and mental suffering and to maintain a degree of fitness compatible with self-preservation. Measuring welfare is difficult, but the scientific literature references a number of potential welfare indicators. Amongst them we can find physiological indicators such as stress and stereotypic behavior. Firstly, physiological indicators of reduced welfare can be an elevated heart rate or elevated cortisol level (Broom and Johnson, 1993). A second important concept in the response of animals to transport, captivity and confinement is stress, or “stimulation beyond the capacity for complete adaptation” (Broom and Johnson, 1993). When an animal’s coping mechanisms are taxed beyond endurance and break down, the result is stress. A third behavioral indicator of reduced welfare can be “stereotypical” behavior, a repeated, relatively unchanging sequence of movements with no obvious function (Broom and Johnson, 1993). Living in such confined conditions, it is little wonder that many animals in circuses go out of their minds. Frustrated, repetitive, stereotypical behavior takes over. These pointless, stereotypical behaviors (also called stereotypies), with the animal no longer aware of his or her surroundings, do not occur in the wild and are regarded by animal behaviorists as clear signs of distress. We call it “circus madness.” ADI Field Officers witnessed a large number of animals exhibiting such disturbed behavior, including pacing up and down, weaving from side to side, head-bobbing and running in place. Stereotypies are indicators of long-term stress and coping problems. They have also been described in battery-caged hens and in pigs (Fraser (1975) in Maas (2000)), circus tigers (Nevil and Friend, 2003), horses (Brion (1964) in Maas (2000)), autistic children and prisoners (Levy (1944) in Maas (2000)), and many other species on farms and in zoos, laboratories and other captive situations. Abnormal behaviors like stereotypies do not arise in the wild. Broom and Johnson state “In natural conditions, animals are constantly stimulated by changes in their physical and social environments. Where animals are brought under closer environmental control, on farms, in zoos, or in people’s homes as pets, the levels of some of the components of stimulation are reduced, while others are increased” (1993). Animals have specific expectations of the consequences of different activities. If these fail to materialize, the animals cannot activate their own array of controlling procedures (Broom and Johnson, 1993). Some animals respond to a lack of stimulation and a lack of control over their environment with apathy, others with stereotypies or increased aggression (Broom and Johnson, 1993). Both a lack of stimulation and a lack of environmental control are inherent in circus life. Stereotypies are particularly evident in wild species but are also seen in domestic animals, such as farm animals and horses. Broom and Johnson further state: “…in most cases we do not know whether a stereotypy is helping the individual to cope with the conditions, has helped in the past but is no longer doing so, or has never helped and has always been a behavioral pathology. But in all cases the stereotypy indicates that the individual has some difficulty in coping with the conditions, so it is an indicator of poor welfare” (1993). The traveling circus is not a suitable environment for an animal. Restrictions of space, time, mobility and facilities mean that no animal will be able to behave as he or she would in his/her natural environment. Many of the species commonly kept in circuses have highly specialized behaviors, making it impossible to meet the animals’ basic needs. Suffering in both humans and animals is difficult to prove. However, if animals behave in an unnatural manner or exhibit behaviors that cause concern, such concern is justified until proven otherwise. A civilization that considers itself humane would give possible victims the benefit of the doubt. Now, we understand the environmental and social needs, the intelligence and sensitivity of the other species with whom we share our planet. No one is saying ‘end circuses.’ Rather, let’s take animals out of circuses and let humans do the entertaining. As animal circuses close, the trend is that animal-free circuses replace them. The circus industry can still thrive and even increase overall attendance without the stigma of animal suffering.